Stainless-steel chainmail safety glove was constructed with four in one interlocking individual welded rings. Features the adjustable and high tensile strength spring strap and a patented system which makes changing a left-hand glove into a right-hand glove fast and simple. The chainmail safety glove provides excellent cut and puncture protection for meat and poultry workers and for other applications where maximum protection is required. Gloves application: used to protect fingers and hands during meat deboning,meat processing and risky industries etc. 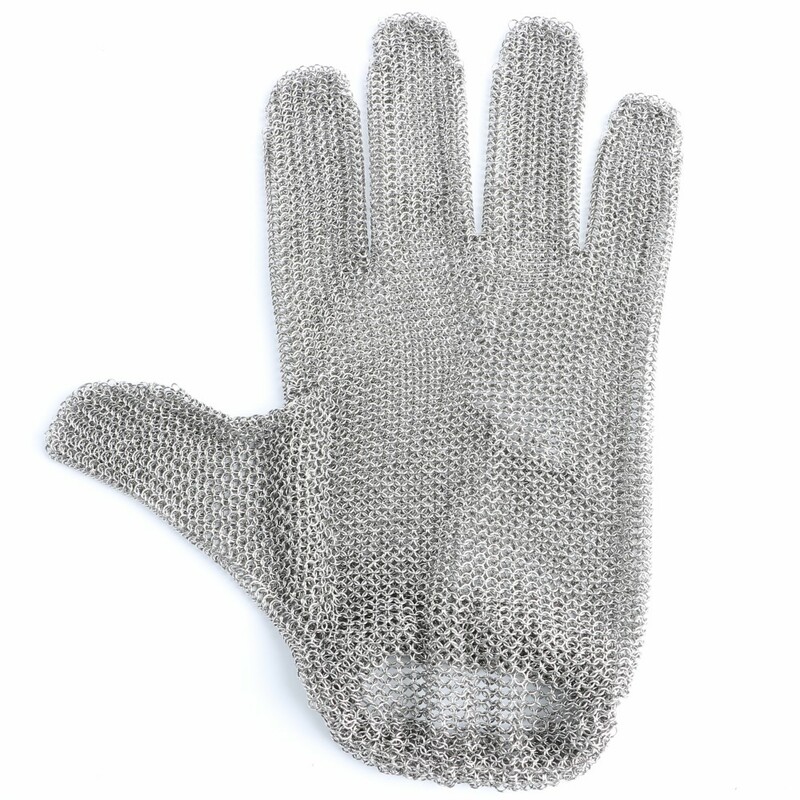 Steel Mesh Safety Gloves are made out of 100% stainless steel with each ring individually welded. Our material goes through strict quality control steps to ensure you the ultimate protection while offering you a premium fit and comfort. Easily concealed under clothing, our steel mesh safety gloves are perfect for on the job protection for law enforcement or any other dangerous job where one has the risk of serious injury from blades or knives. For Chainmail Safety Glove, normally 1 piece glove will accompany with 1 piece tighter. 1,1 piece gloves per poly-bag, then 10pcs in bigger poly-bag, and then 50 pieces per carton. 2,1 piece gloves per poly-bag, then 1 bag per inner box, and then 50 inner boxes per carton. Sino(Beijing)Technology Co.,Ltd is a high-tech innovative enterprise integrating product research and manufacturing, sales, international trade and after-sales service.Our main products include stainless steel mesh anti cut glove, stainless steel mesh cutting resistant apron, stainless steel chainmail scrubber, stainless steel decoration curtain, etc., Our ring mesh products are widely applied to the slaughterhouse, meat processing factory, aquatic products processing, garment cutting factory, cutting tool factory, glass factory, large restaurant, hotels, and chain supermarket, exhibition hall and other high grade places. Sino has a complete and scientific quality management system, always in line with the "integrity, innovation, win-win" business philosophy, with its superb professional technology, high-quality management level, to provide customers with quality products and services. With powerful technical force, exquisite workmanship, serious working attitude and perfect after-sales service, Sino has been well known world wide. Its products were not only distributed all over the China, but also were exported to most foreign countries. Copyright Notice © 2014 worldinmfg All rights reserved.